lesliekeating: goals + resolutions aka oh, nine. goals + resolutions aka oh, nine. What a wonderful set of resolutions! I'm a mum to an almost one year old boy, and am so impressed at what you have achieved with your projects since having Mae. You should be so proud of what you've produced (most especially your little girl!). I am slowly venturing into the world of quilting, and just love your scrap quilt! Is it machine pieced? So awesome, and it must bring back great memories of projects you've completed with the fabrics. You've inspired me to get my tangible list of resolutions done too. Thank you for sharing your wonderful blog. i wish i could sew...I will do it vicariously through your blog! ps I love a good list! love the quilt. scrap quilts are a lot of fun. I still have mine, sitting at the bottom of my drawers waiting for more scraps. for sadie but it seems so un-doable at this point with 22 months to document... it goes too fast. 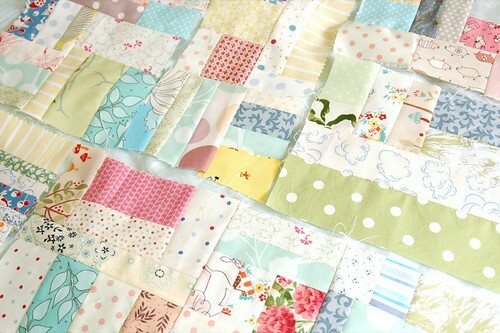 Your scrap quilt looks lovely! I remeber that large size quilt- that one was so inspiring. Hayden is 2 yrs, 8 mos ... and I *still* struggle mightily with #10. And now I have baby #2 here!! Oy vey! We make a Hayden Year Book every late December to send out as holiday gifts for the grandparents and great grandparents. They all love it, and really look forward to it. Makes life a lot easier for us on the gift-giving front, too! I highly recommend it.